The Annecy for Demi Bags brings the inspiration of the French Alps and high fashion styling together to create a look that is absolutely stunning. 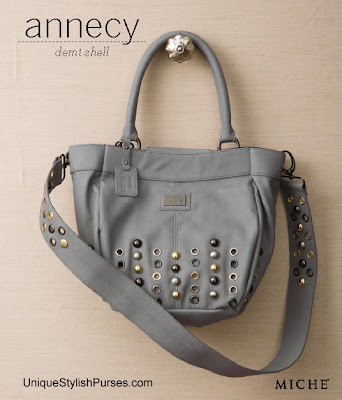 Glacier-grey soft faux leather is accented by oversized stud and grommet detailing in various metallic colors. When the sun hits Annecy just right, she glistens like icicles atop Mont Blanc. Get your shine on wherever you go when you carry this unique Shell on your arm!